This Military Flag Case is constructed as a shadow box and doubles as a photo holder. This double use makes the display case great as a burial flag display case; a military flag display case; a veteran flag display case; a police flag display case; a memorial flag display case; a Navy flag display case; an Army flag display case; and a flag and medallion case. Store everything in this flag case and shadow box and never worry about misplacing your treasures! This Military Flag Case is available in a deep, rich cherry Or Oak finish, although you have a choice of the type of finish you would like on your case. 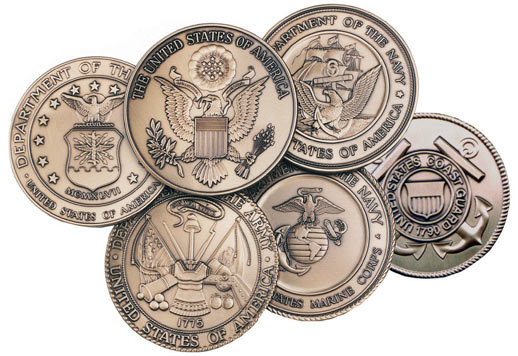 As with all of our flag display cases, the Military Flag Case is an American-made product. Each flag display case is constructed from premium woods and hand-finished to bring out the natural beauty of the wood and made to fit your needs. The photo holder adds a new dimension to the flag display, further personalizing the entire presentation by connecting the special memorial flag with a face or a place. 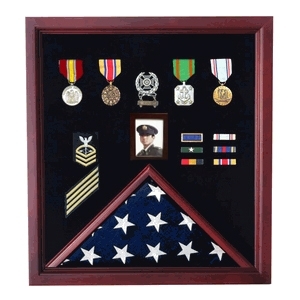 Bring your military flag display a little closer to home with this Military Flag Case with Shadow Box and Photo Holder. Optional engraving for your flag case is available. This memorial flag case is just the thing I was looking for to honor my late father. I had a classic cremation urn before, but felt that this solid wooden case was a bit more suitable with its flag overlay. He served for 20 years in the force and this was very appropriate. I wish I knew about these before. Nothing but the best for Dad.